Here are new scooters to be launched in 2016 in India. 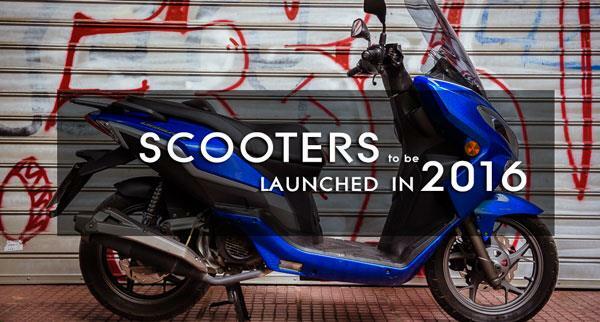 Indian scooter marketing is all set to see a bunch of new scooter models in the year 2016. Take a look at the upcoming scooters in India. Scooters are loved by everyone. Safe, economical, comfortable, spacious are the terms easily associates with a scooter. This is why despite many stylish motorcycles and low budget cars, scooters still found place on every street. To give you new ride experience in 2016 we did the rounds of Indian Scooter Market. The Yanaha NMax by Japanese manufacture was first unveiled in 2015 in Israel in late 2015. This stylish two wheeler will be available for Indian consumers in 2016. In style it's somewhat like Maxi Scooter and features European design. Powered by 155cc, liquid-cooled motor it's capable in producing 15PS of power and 14.4 Nm of torque. The Blue Core Technology embedded with Yamaha NMax will give you better full efficiency. In design it's promising to give you maximum comfort while riding or pillion. At present Yamaha NMax costs approximately Rs 1.3 lakh in Indonesian market. In India, it is expected to cost around Rupees 95000/- on road. The Honda Lead is new and upcoming scooter from Honda for a lump sum price of Rs 55000/- The scooter will be fitted with 125cc engine, liquid cooled, single cylinder engine. However, you have to wait till 2017 to be on the gears.